Helmshore has lost a brave young fellow in Private Soloman Hanson, Grenadier Guards, who fell in action on August 1st 1917, age 22. He was the eldest son of Mr. and Mrs. Albert hanson, of 1 Station Brow, Helmshore. At the time of enlisting 13 months ago he was a firebeater at Holme Bleachworks, Rawtenstall, and his name is on the roll of honour of Musbury Church, which he attended regularly. He went to the front a year ago. 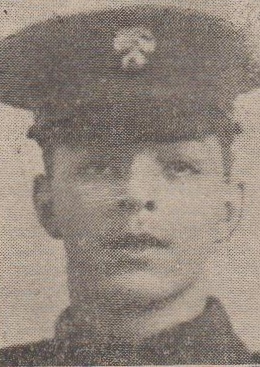 His younger brother, Private John James Hanson, Lancashire Fusiliers, although only 19, has been wounded twice - the last time being when two of his toes were blown off, - and he is now at Bury Military Hospital. The youngest brother is 17. The father himself is an old soldier. He served 10 years with the Lancashire Fusiliers, and received his discharge in 1889. In loving memory of Private Soloman Hanson, Grenadier Guards, eldest son of Albert and Annie Hanson, of 1 Station Brow, Helmshore, and who was killed in action on August 1st 1917. And now he has gone to rest. His resting place a soldier's grave. May his name on Thy book be found. From his Father, Mother, Sisters and Brothers.